It was 3:46am and I was still awake. When this happens – I can be extremely productive with a keyboard on my lap, so I don’t complain – I embrace it. Imagine my surprise, when I powered down, shut off the lights and walked out of my office. Those were the words I uttered and I had to laugh to myself because that was the same expression written on Jaxson’s face. 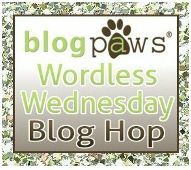 BlogPaws Wordless Wednesday Blog Hop. Lilly is my loyal late night lovebug. When I’m up… she’s up. But she does give me the look that Jaxon gave you! Hey there stranger! Are you three re-united yet? I was thinking about you the other day. How have you been? As of TONIGHT!!! 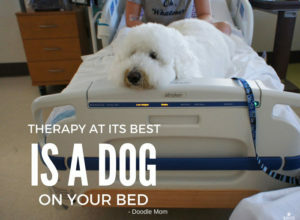 I have two shaggy doodles with me in bed right now!!! All is back to normal. Ahhhhh. I am grateful. Thanks for asking!!! Whew! I was really getting worried – I kept thinking about you all hoping your separation period was over. 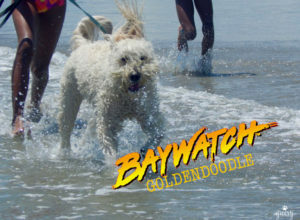 HalleDOODLElujah! I used to be an early riser – until I “retired” and started watching movies in bed at night – now I need to start getting used to that routine again as I get closer to the externship portion of my vet assistant course. Ducky and Shadow have gotten used to sleeping later, too. But Shadow follows me around the house all day long, so I don’t get “the look” from her. Oh my, that is late. We are in bed by 9 or 10 at my house as Mom is always up around 5. We need our beauty sleep! No caffeine in the evenings is a good idea. The other night I forgot to give the dogs their eye medicine until after midnight. When I woke Leo on the couch to give him the drops, he looked so sleepy and so annoyed. Made me laugh. It’s funny how they can exhibit so much expression in their tiny faces. I have one dog who moves around the house with me everywhere, if I get up in the middle of the night for water, he’s there. I have another who will sleep in under the covers all morning and I have to physically pick her up to get her to come have breakfast. 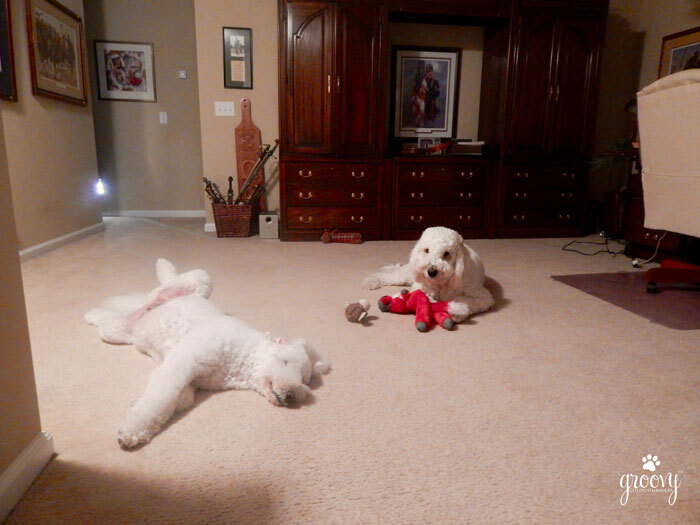 Love the sprawled legs, crashed out Doodle pose! I can certainly relate! Both Boys seem to want to be within eye sight of me at all times. But Harley is not staying awake past 10pm. He’ll be close – but he’s going to sleep, legs wide open kind of sleep! Thanks for stopping by – come back again soon! Hahahahaha! I’m a night owl too, but I don’t have coffee after around 4pm for fear of being up all night. 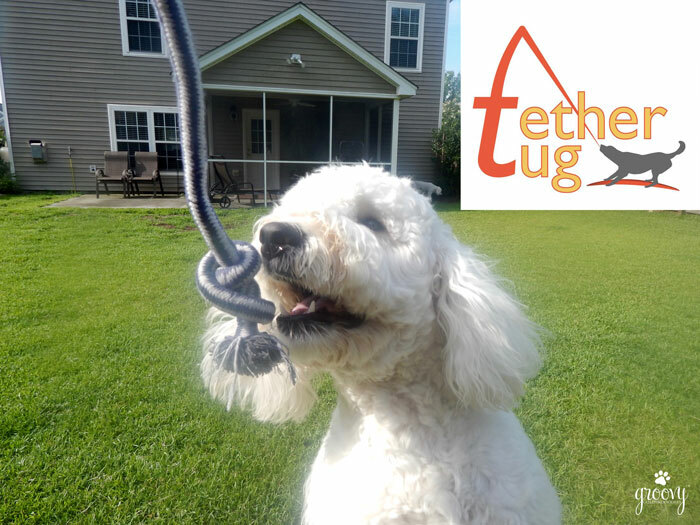 We love our tether tug toy! Someone will be lucky to have it! I’m typically a morning person – and I can’t take naps – therefore I cannot stay up as late often because I will be exhausted over time. But I do feel extremely creative after midnight. Wow, if I have caffeine after noon, I can’t sleep! 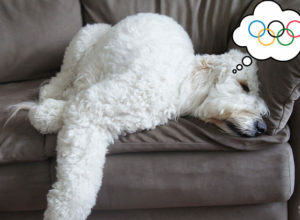 And Rita – she loves to sleep. Usually she’ll stay up with us until 10:30, but if she’s really beat she’ll head to bed early. Oh boy, do I know that look so well! Sometimes we just need to work or write when the mood hits us. The problem is, there’s usually no sleeping in the next day because the pups are wide awake and ready to go, right? Hahahaha! And that is exactly why I try not to drink coffee after 2 pm. Rebekah – I’m slowly learning! I’m a late night worker and the dogs usually pass out well before I do…although Archer and Raven will play throughout the night if I let them. You know when kids sneak in late at night and get caught tiptoeing down the hall way? That’s the expression on his face. What on earth are YOU doing up so god dang late?! Oh yLindsay – you know Jackson so well. He was in the middle of tearing all the stuffing out of the toy – that’s why he had that “busted” look on his face! He is kinda in the middle of destroying a great toy!! So, Jaxson, you’re busted!! Yep! That’s why he was so shocked! He didn’t think he’s get caught tearing the stuffing out of the toy! If I stay up too late, Mr. N will come stare at me until I head to bed. He doesn’t care what I do once I’m in bed but he feels like he can’t retire for the night without me there! Harley just needs to know I’m close, if it gets too too late he’ll drop where ever he is and start snoring in minutes. Jaxson tries to take advantage of my late night hours and begins to prowl around looking for trouble. I’ll admit to late-night computing, too. 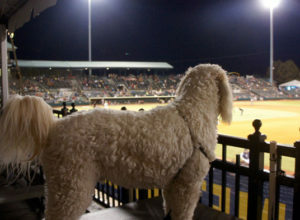 But my dogs rarely get up to supervise. When I finally head back to bed, they’re right where I left them, snoozing in their little dog beds. Not mine, they follow me around from room to room, when it gets late, Harley will fall out wherever we are, but Jaxson starts to roam looking for mischief. They’re all little characters aren’t they? Too funny! I often have trouble sleeping but haven’t gotten to the point where I”ll give up and just get up and be productive. If I did, Luke would be right with me…but the girls wouldn’t budge off that bed no matter what!